all from the Greek word meaning heavy. he found in pyrolusite, a manganese mineral. his barium oxide to pure barium. 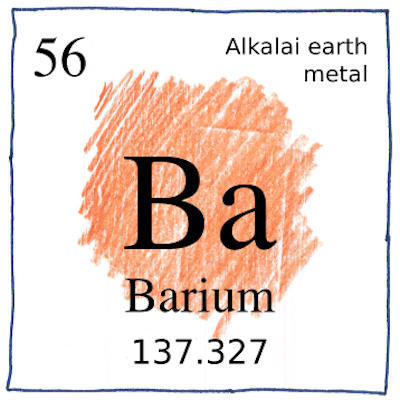 and named the new metal barium. Wedgwood’s Jasperware contains barium sulfate. the state gem of California. baryte isn’t toxic because it’s insoluble. Barium in a vacuum tube ties up trace gases. Barium sulfate makes a good white pigment for paints. because it’s insoluable and heavy. contain more than forty percent barium. but unlike nitrogen doesn’t bond with itself. things get a little sticky. Carl Wilhelm Scheele discovered oxygen three years before Priestly, but Priestley was first to publish. Scheele discovered chlorine but misidentified it. He almost isolated manganese, and almost isolated barium. Acumulated exposure to acids and heavy metals contributed to his death at the age of 43.